Volcanoes are endlessly fascinating for so many reasons, not the least of which is the way they make their own weather. Mt. 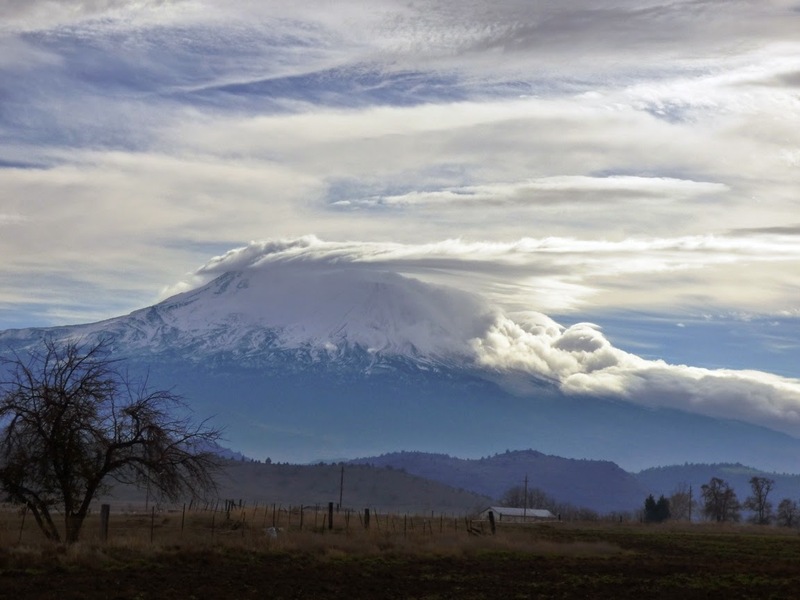 Shasta, at the south end of the Cascades Range is no exception, as it rises around 10,000 feet above the surrounding valleys. The view of Shasta this morning was much different than it was on Thursday! It's really nice to see even more snow coming this week. 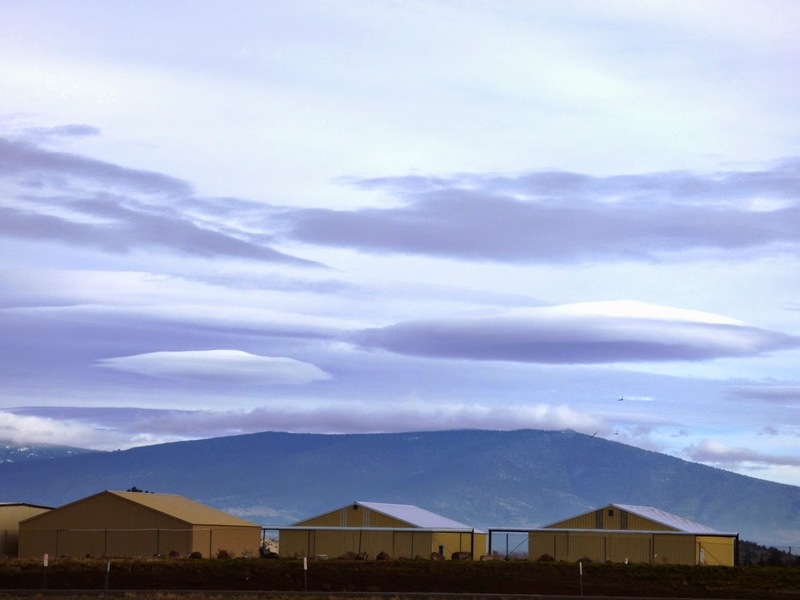 The strange lenticular clouds often seen around the mountain's summit have given rise to all kinds of speculation about UFOs and that kind of thing. The reason for the cloud phenomena, as mentioned yesterday, is the condensation that occurs as humid air is pushed over the summit by prevailing winds. As the air mass sinks on the leeward side it evaporates again. A storm system was moving through the area on the far side of the peak. Mt. 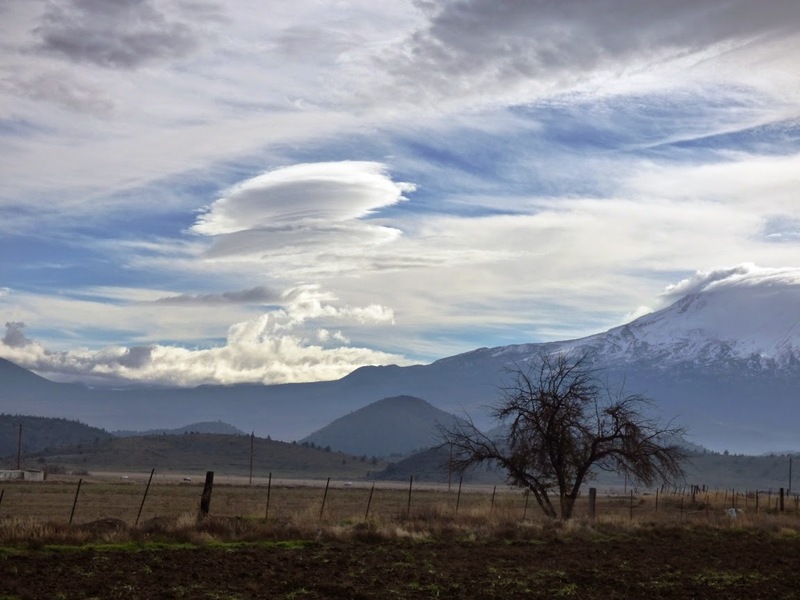 Shasta never fails to be an interesting sight, no matter the season or hour. One of the most fascinating views I've ever had was one I couldn't catch on camera, but it stole my breath away. We drove up through Redding one night in a rainstorm that turned to snow as we approached the mountain. We were worried about reaching our destination at the late hour in the drifting snow. 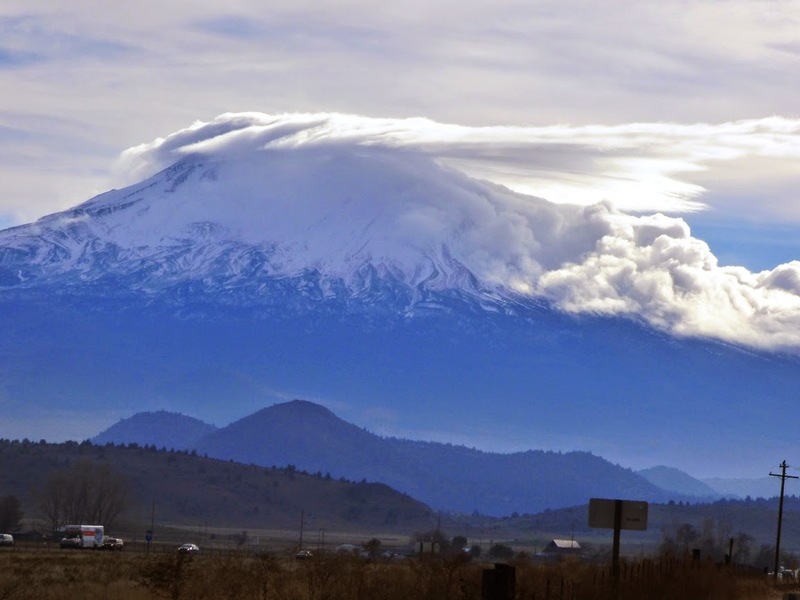 When we reached the far side of the mountain near Weed, the clouds parted and Shasta appeared, completely clear, and bathed in the light of a full moon. Unforgettable, and downright mystical. I am a teacher of geology at Modesto Junior College and former president of the National Association of Geoscience Teachers, Far Western Section. I have led field trips all over the western United States, and a few excursions overseas, but my homebase is the Sierra Nevada, the Great Valley, and the Coast Ranges of California. Is there something about geology that you are curious about? Do you have questions about the scientific aspects of political controversies? I can try to provide a scientist's perspective. Your questions and possible answers could be a springboard to a blog discussion, or they can be private. Anonymity is always assumed. Contact Geotripper at hayesg (at) mjc.edu. Click here for All-geo, the latest in geology news from around the web. 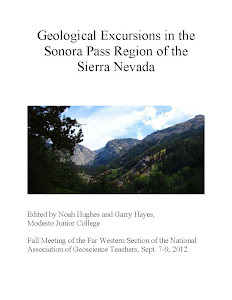 Geology of the Sonora Pass Region! Read about Geotripper in the Washington Post! The Other California: what to see when you've seen all the really famous places in the Golden State (in progress). Into the Great Unknown: A rafting journey down the Colorado River through the Grand Canyon. The most incredible adventure of my life (so far)! The Hawai'i That Was: An exploration of the geology, natural history, and anthropology of the most isolated lands on the planet. It's a lot more than beaches, shopping, and palm trees! Driving Across the Most Dangerous Plate Boundary in the World: A journey across the former subduction zone that formed much of Central California, including the Coast Ranges, the Great Valley, and the Sierra Nevada. 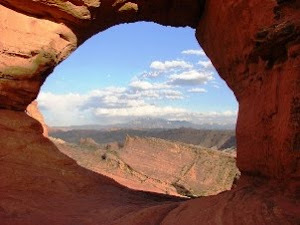 Vagabonding Across the 39th Parallel: A journey through the geological wonderland in central Nevada, Utah and Colorado. A Convergence of Wonders, a compilation of posts on our journey through the Pacific Northwest and Northern Rocky Mountains in 2011. The Abandoned Lands, a compilation of posts on our journey around the margins of the Colorado Plateau in 2012. Out of nowhere, a strange political issue: California's state rock is serpentine, and there is a effort to remove it. Learn why we shouldn't in this series of posts on a beautiful rock. The Airliner Chronicles: My First Blog Series - Seeing geology from the perspective of seven miles above. See Of Vooks and Blooks (and the comments) for an explanation of the title! A New Year. Do Something New. See a New Place.